Sometimes it feels like you need a gun to your head to actually be productive as a writer. What if you had to write like your life depended on it? Would you produce your best work? Author Paul Sheldon (Andrew McNee) has to do just that in Misery when his “number one fan” Annie Wilkes (Lucia Frangione) rescues him from a car crash and holds him hostage. Based on Stephen King’s thriller, this chilling production combines innovative set design, riveting acting, and a sharp script to keep audiences on the edge of their seats. Annie wants Paul to write another book in his Misery Chastain series and she won’t take no for an answer. The only problem is, Paul killed off his beloved character in his last book. 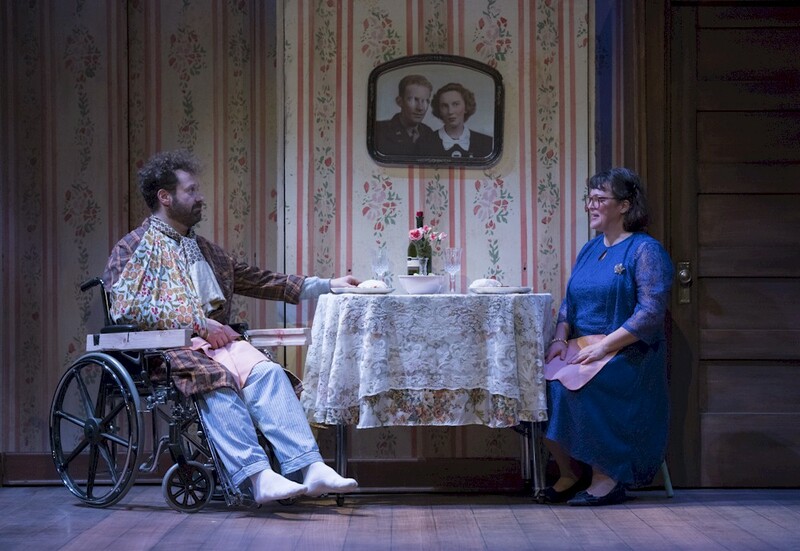 With broken legs and little strength, Paul has no choice but to acquiesce to Annie’s demands and try to pound out a new novel on the antique typewriter she buys for him. Isolated in the mountains of Colorado, nobody knows where he is, and the Sheriff (Munish Sharma) that comes looking meets a nasty end. Directed by Rachel Ditor, McNee and Frangione are a wonderful duo as they play to the nuances of this strange relationship. Annie is a kind, doting fan one minute and a psychotic, violent taskmaster the next. Paul tries to retain his sense of humour: “Somehow I don’t think Tolstoy write this way,” he says wryly to himself. Representing Paul’s psychological trauma, the set by Lauchlin Johnston is full of doors that appear and disappear. When he drags himself out of bed to try to escape, the bedroom door moves farther away, showing that, for him, the distance feels insurmountable. Other scenic elements also morph before our eyes, such as Annie’s house that sits doll sized in the centre of the stage before we move inside it for the duration of the play. Full of suspense, this tale of dysfunctional writing partners is gripping right until the final haunting scene.